"We remain confident in our ability to close targeted asset sales within the 18 to 36 month timeframe we shared with investors in May, and we will use proceeds to continue our de-leveraging efforts," LaRue continued. 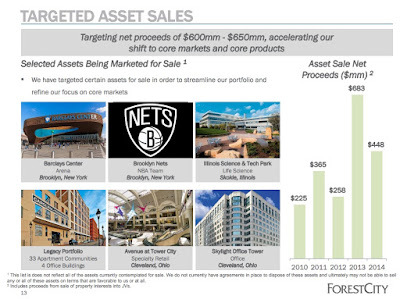 The timing of these asset sales will not impact our timeline for REIT conversion." LaRue cite construction on six new projects, with another by year-end. "This robust level of activity reflects our strategy of activating entitled development opportunities, including through our ASRS [Arizona State Retirement System] fund and our strategic partnership with Greenland, USA. As these new properties are completed and stabilized, they will contribute meaningfully to future results." In May, when the company reported on first quarter results, 550 Vanderbilt was not officially under construction. That building has a few more questions marks, notably the need to extend a loan, as I wrote separately today. 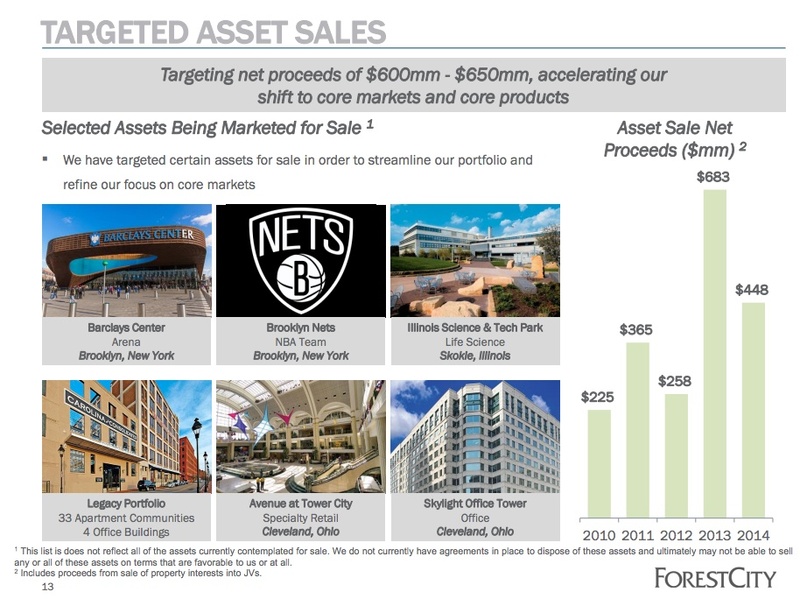 A newly filed document reveals more than previously about the dealings between Forest City Enterprises, which controls Nets Sports & Entertainment (NS&E)--which owns 20% of the Brooklyn Nets and 55% of the Barclays Center-- and Mikhail Prokhorov, whose Onexim Sports & Entertainment owns 80% of the team and 45% of the arena. Basically, Forest City would have to pay off $50 million in Nets debt, $350 million in arena debt, and $25+ million to Prokhorov for loans. It also would get a much larger share of the proceeds to NS&E--it owns 62%--because the minority partners must repay $237 million in loans and interest. NS&E did not fund the Nets capital calls related to the 2013-2014 and 2014-2015 NBA basketball seasons, respectively. 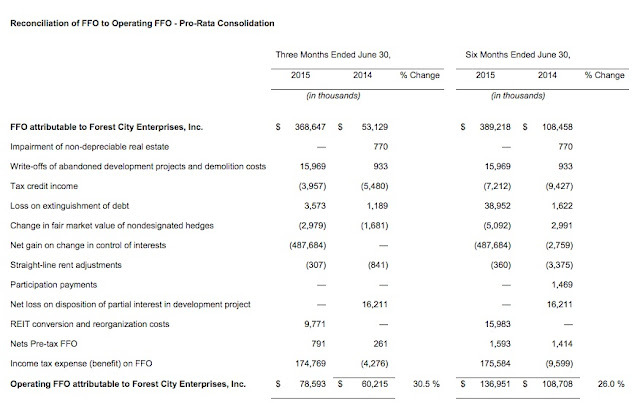 This did not constitute a default under the agreements related to Forest City’s investment in the Nets because, in 2013, NS&E entered into a forbearance agreement with the majority partner. Under the forbearance agreement, the majority partner agreed to fund NS&E’s portion of Nets capital calls through July 12, 2015 and forbear the majority partner’s right to dilute NS&E’s ownership interests in the Nets for a period of two years in exchange for a fee. In July 2015, NS&E and the majority partner amended the forbearance agreement to extend the forbearance period to August 12, 2015 for an additional fee. Upon expiration of the forbearance period on August 12, 2015, NS&E is required to repay the majority partner approximately $25,000,000 plus related fees. In addition, NS&E is obligated to fund approximately $6,300,000 for its share of a Nets capital call for the upcoming 2015-2016 NBA basketball season by August 12, 2015. If NS&E does not fund the forbearance amounts, related fees and the 2015-16 Nets capital call by August 12, 2015, NS&E’s ownership interests in the Nets will be diluted from 20% to approximately 8%. Based on continuing discussions with interested parties regarding the potential disposal of NS&E’s ownership interests, management believes the value of its current 20% ownership interest exceeds the funding requirement necessary to maintain that 20% ownership interest. During the six months ended December 31, 2014, Forest City began discussions with several interested parties for the potential sale of its ownership interests in the Nets. Through those discussions, certain parties have also expressed interest in acquiring all or a portion of our ownership interests in Barclays Center. In the event of a sale of NS&E’s ownership interests, NS&E would be entitled to the remaining cash proceeds after assumption of our proportionate debt, which approximates $50,000,000 related to the Nets and $350,000,000 related to Barclays Center, and repayment of certain funding requirements made by the majority partner in the Nets on behalf of NS&E related to the July 2013 and 2014 capital calls of approximately $25,000,000. We have also made certain loans to the minority members of NS&E and such loans are required to be repaid to us prior to the minority partners of NS&E being able to participate in the distributable cash flow from any sale. At June 30, 2015, approximately $237,000,000 of priority member loans and related accrued interest remain outstanding. Any remaining cash flows after satisfaction of the priority loans would be distributed in accordance with the legal ownership of NS&E (approximately 62% to us and 38% to the minority partners). The document then repeats the language from the July document regarding the requirement that NS& repay Prokhorov $25 million plus related fees by 8/12/15, and then fund $6.3 million for its share of a Nets capital call. The document does not mention negotiations to extend that forbearance period. Based on continuing discussions with interested parties regarding the potential disposal of NS&E’s ownership interests, management believes the value of its current 20% ownership interest exceeds the funding requirement necessary to maintain that 20% ownership interest. There wasn't anything about the Barclays Center in the press release, and very little about this Nets. The below chart indicates that FFO from the Nets in the second quarter of 2015 was $791,000, up from $261,000 in the previous year, while FFO for the first and second quarters was $1,593,000, up from $1,414,000 in 2014.